In less than 24 hours we’ll know what the next year holds for Apple and likely most of technology. Apple’s announcements tomorrow will likely set the pace for the tech industry for the rest of the year. While I was able to mostly avoid the rumor sites some things did spill over into mainstream news. It appears that the Beats deal was true and Apple has confirmed they bought Beats for 3 billion dollars. I for one am glad to see that they did the deal, but I’ll save that for another post. Overall I haven’t heard about too many rumors. One of the few that I need to add to my previous post is the addition of home automation. I highly doubt this one will come to pass. If it’s true then it’s a shame that Google bought Nest. Nest would have fit nicely into Apple’s portfolio. Out of the 11 items above I seriously doubt we’ll see six, seven and eight. They just don’t seem to make sense on iOS. I also highly doubt we’ll see number one right now. It might be something that’s released in September, but not now. Ditto for number two. Number three strikes me the strangest of the group. The cable is only two years old, I doubt they will make any changes to it. If they do I bet they will make the cables more robust, or modify the connector so that it is less likely to degrade. There have been reports that people have been having issues with the contacts on the lighting connectors failing. With those out of the way let’s discuss what will probably happen. Number 4 might happen. It seems like a good transition from the PC era to the post-pc era. If the iPad is truly a replacement for the PC then it will need to have some form of multi-tasking. Number 5 is also likely to happen, but it may not be announced at WWDC. More likely than not it will be announced when Apple unveils the iWatch, or whatever they’re going to call it. I will also go on record as stating that the iWatch is actually the next generation of the Nike Fuelband. I believe that Apple and Nike have come to an agreement and Nike will be the de facto fitness division for Apple. The Shazam integration with Siri also seems to make sense. It fits with the other types of integrations we’ve seen to date with Siri. Instead of an open api we have vetted partners that agree to integrate with the service. This controls the experience and in Apple’s opinion creates a better experience. The redesigned notifications center also makes sense if for no other reason than the fact that no one understand the difference between the three tabs that are currently present. We have the Today tab that tells me my appointments, stocks and weather. We have the All tab that shows me my notifications and what I missed. We have the Missed tab that usually shows me nothing because I already saw the notification somewhere else. (most likely on the All tab). I for one think this will be a welcome change. Finally there’s the wireless version of CarPlay. I just recently got a new Ford Focus that has Bluetooth and I believe that the ability to wirelessly integrate with a smartphone in the car is Genius. I do have two small caveats with it though. The first is that current track information is not sent via bluetooth. I assume this is something that CarPlay would address. Secondly when you’re connected to the car wirelessly then you’re not charging your phone. That’s fine for short trips, but it’s lousy when you’re going on vacation and you have an eight hour drive. That remains the one advantage of wired access. Your device is being charged while you use it. By staggering the iPhone sizes Apple would be re-introducing something it used to do with the iPods. By changing the screen sizes of all the iPhones Apple would be creating a clear distinction between the different models, a good, better, best kind of distinction. While one could argue that screen size alone does not detail the superiority of a particular model it at the least would create different use cases for each model. Today it’s hard to determine the different use cases for the iPhones. It usually just comes down to budget…. and if that’s the case everyone will want the newest or the cheapest. Hence the lackluster sales of this year’s middle tier iPhone; the 5C. The current rumor mill does point to Apple making a larger iPhone… we’ll just have to wait to see if this pans out. iTunes to Offer Free HD Upgrades on Movies? I received the email below from Apple regarding the availability of an HD download for a movie I own. 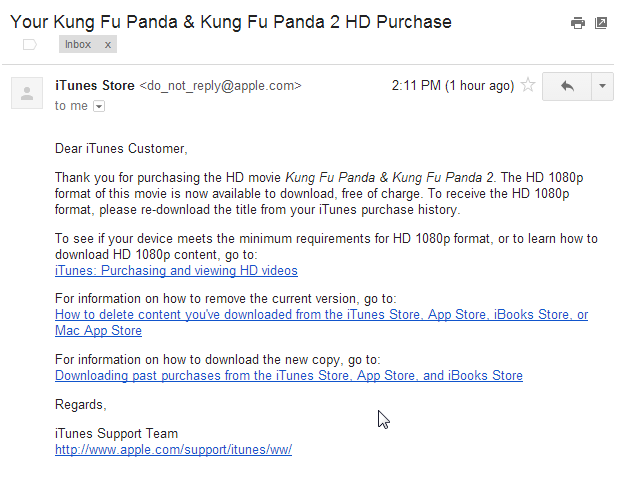 The email suggests logging into iTunes and going to purchase history to download the movie in HD. When I tried to do that I didn’t see both movies available in HD, which may mean they haven’t turned the feature on yet. Hopefully this feature will be forthcoming… it’s about time iTunes went HD only. On Wednesday Apple released an update to iTunes. You can read Macworld’s article about it here. After reading through the comments I realized a lot of people were having problems finding the new wish list feature. The wish list is now part of the menu that previously housed the Preview history. To access the wish list click the three horizontal lines to the left of the iTunes store button. 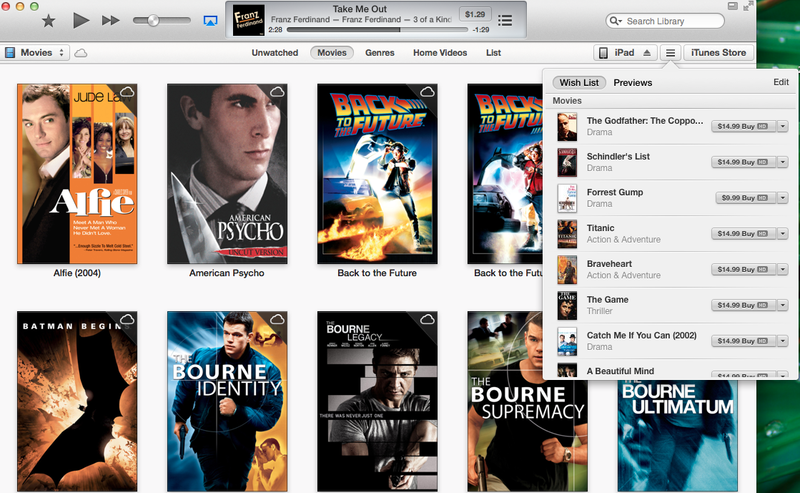 In the screenshot below you can see the wish list is available as I browse my Movie section of iTunes. Matt Quinn @IamMattQ recently posted an article over at Medium an article entitled Why I Dropped eBooks. It’s a great article and well worth the read. There is no troubleshooting for paper books. When people know what you’re reading they’re more likely to engage you. Far fewer distractions while reading a real book as compared to an ebook. The tactile experience is unmatched. You own what you buy. In many ways I completely agree with Matt. On the surface many of his points make sense, however once you dig deeper it becomes apparent that eBooks will still win. For all their flaws, they still have some advantages over books that will become even stronger as we continue to move away from paper and move more and more into digital media. Just look at all the things that can go wrong when you’re attempting to read or purchase an eBook. For starters you must have an internet connection. If you don’t you’re out of luck. Secondly your device has to have battery so that you can actually read the darn book you just bought. Problems like this can be cumbersome, but there are advantages to ebooks as well. Have you ever been someplace where you can’t find a bookstore? Nowadays there are fewer and fewer stores. While it may be a hassle to get online, make sure your credit card is valid, search for your book, it is still potentially much more convenient than driving across town to go to the last remaining book store in your city. As for the battery issue there’s a silver lining…. you can read in the dark. Most ereaders as well as tablets and smartphones have backlit or frontlit displays. Matt’s right, there can be more troubleshooting involved with eBooks than paper books, but I don’t think those problems present a large enough issue to ditch ebooks entirely. I’ll admit, I don’t read in public often, but I have been known to ask people about the books they’re reading. It’s human nature. We want to be engaged and involved with those around us. That being said, I think we’re beginning to see the new equivalent of this in the online world. Sites such as ReadMill and Goodreads are replacing the in person engagement and potentially providing an even greater platform for sharing our experiences. While the author Sherry Turkle makes a compelling argument in Alone Together: Why We Expect More from Technology and Less from Each Other. that we are engaging each other less and less, I think ultimately we will understand how to use these technologies to bring us closer together in real life. While a smartphone or tablet is likely to constantly ping you with the latest news, game request or text message the same can’t be said of dedicated ereaders. They lack nearly all of those functions. As for tablets and smartphones my iPad can be placed into Airplane mode (why do we still call it that?) I also often forget to do this as well. However, since we’re talking about software here, there is a simple solution. When I open the Kindle app, Nook app or iBooks the iPad (or Android tablet) should be smart enough to disable all notifications. That would go a long way to providing distraction freed reading on those devices. He’s right about this one. Holding a book is definitely a more tactile experience than using an electronic device. That doesn’t mean it makes it “better”. If the goal is to read the book then shouldn’t everything else just get out of the way and let me read? I am willing to say this one comes down to personal preference. This one is simply a function of publishers being scared of becoming the next music industry. They are scared to death that if they sell books without DRM then one person will buy a book and give copies to everyone else. I think they music industry is actually the model to look to here. We haven’t had DRM in iTunes, Amazon MP3 or Google Music for years. People are still buying music. Artists are still making money. There’s no reason to believe that books would be any different. In fact I think people that read are more likely to want to support the authors they love. If DRM (digital rights management) was removed from books then most of this argument about sharing would go away. Sure, you might have some people that abuse the system, but on a whole I think we would all be better off for it. Finally Matt’s last point is that we don’t own the ebooks that we buy. While it’s true that Amazon can decide to remove a book from it’s servers I don’t foresee this being that big of an issue. If you’re really that scared about all of your books disappearing then the best thing for you to do would be to back up your purchased to an external hard drive (or even a flash drive). Books are extremely small, you could fit every book you’re ever going to read onto one 32GB flash drive that costs $20. In the end the goal of the book is to share ideas and tell a story. The internet and the myriad of connected devices have been able to do more to spread ideas in the last 25 years than the printing press was able to do in its first 100. More people have the ability to present more ideas to a wider audience than at any point in human history. The spread of ideas will not be slowing down any time soon. This is one of the strongest reasons that ebooks will eventually win. It is simply easier to get an ebook into the hands of more people more quickly than with traditional publishing methods. I’m not saying that ebooks will completely replace print books. I don’t think they ever will, but eventually they will make up the lion’s share of books sold. If history is any guide, I think we’ll benefit from this change.